The invention relates to modified cyanacrylate esters, which can be obtained, for example, by esterifying cyanacrylic acid with an aromatic principle comprising at least one OH group, and to compositions, which are active with regard to washing or cleaning and which contain at least one nanocapsule or microcapsule consisting of a capsule enclosure and of a capsule contents, whereby the capsule enclosure contains at least one polycyanacrylate ester. The invention also relates to microcapsules that are produced by using at least one modified cyanacrylate ester. The present invention relates to modified cyanoacrylate esters, which are obtainable for example by esterification of cyanoacrylic acid with at least one OH group-having fragrance active detergent or cleaning compositions containing at least one consisting of a capsule shell and a capsule content nano- or microcapsule, wherein the capsule shell at least a Polycyanacrylatester and includes microcapsules, which were prepared using at least one modified cyanoacrylate ester. In the use of detergents and cleaning products it is often desirable that certain ingredients of the detergent or cleaning agent are released only after treatment of a substrate with such a washing or cleaning agent. For example, ingredients such as fragrances, anti-adhesive or antibacterial compounds should also exhibit a long-lasting impact as possible even after the actual washing or cleaning process. A similar need also exists for personal care products, especially in products for cleaning and care of hair, where in particular a possible over the actual treatment of the hair addition, long-lasting fragrance is desirable. When such active ingredients used in unprotected form in a corresponding washing or cleaning agent, so they act, although directly on a correspondingly treated substrate, the majority of the active compounds is, however, disposed of together with the wash liquor. The same applies if means for body care, which are commonly used in aqueous form, for example in compositions for hair care, such as shampoos or hair rinses. In such agents often a large portion of the corresponding active ingredient is lost through the washing process itself. The adhesive on the substrate lower portion of the drug originally used gives this even beyond the end of the washing or cleaning process, certain even for a short time, desired characteristics, they lose due to the direct influence of environmental factors such as light, air, heat , moisture and friction, however, quite quickly. If this effect is to be avoided, as care must be taken first, that the largest possible part of the present in washing or detergent actives to a survive the washing or cleaning operation without prejudice and on the other the highest possible proportion of the active ingredient on the treated substrate remains and after completion of the washing or cleaning process loses its effect only within a long period as possible. From detergent technology it is known to release certain detergent ingredients by encapsulating these substances in microcapsules only after a certain period of time during the washing process. Thus 97/24177 microcapsules are described for example in WO containing a detergent enzyme and used in a liquid detergent. The described capsules dissolve in the course of the washing process, however, so that the ingredient is free in the wash liquor. DE-T 691 10 070 relates to a composition for cosmetic and / or pharmaceutical treatment of the uppermost layer of the epidermis by topical application to the skin and the corresponding manufacturing process. The compositions described contain nanoparticle, biodegradable polymer, at least one active agent in the form of an oil and / or at least one active ingredient contained in an inactive carrier oil or an active oil capsules wherein the active ingredient which manifested itself in the upper layers of the epidermis pharmaceutical has effect. A nano- or microcapsules containing washing or cleaning agent or a corresponding means for personal care is not described. WO 94/17789 relates to nanocapsules, comprising an aqueous phase contained in a polymeric capsule wherein the polymer capsule consists of a crosslinked polymer. A nano- or microcapsules containing washing or cleaning agent or a corresponding means for personal care is not described in the document. FR-25 15 960 relates to a method for manufacturing biodegradable nanocapsules. The nanocapsules described therein are used for example for the encapsulation of perfume, wherein an extension of the fragrance effect will be described. The use of modified cyanoacrylates for preparing such nanocapsules, as well as the use of nanocapsules or microcapsules in detergents or cosmetics is not described in the document. Therefore, from the prior art, no satisfactory solution is known as an active ingredient in a detergent or cleaning agent or an agent for personal care can be used such that it substantially without prejudice to survive the washing, cleaning or maintenance operation and then a significant amount of drug deposited on the treated substrate. Furthermore, no satisfactory solution to the problem is known from the prior art that a so obtains its desired effect for a long period after the treatment of the substrate deposited on a substrate maintained active ingredient. Moreover, no solution is described in the prior art, such as an only develops its effectiveness such deposited on a substrate of active compound, if so desired by the user. The present invention therefore has for its object, determine solutions for the above problems. The inventive solution is described in the text below. wherein R is a branched, saturated or unsaturated, optionally substituted hydrocarbon radical having at least 6 carbon atoms or a linear unsaturated, optionally substituted hydrocarbon radical having at least 6 C-atoms or an optionally substituted, saturated or unsaturated cyclic hydrocarbon radical having at least 5 carbon atoms or a substituted with at least one linear or branched alkyl, alkenyl or alkoxy aromatic hydrocarbon radical having at least 7 carbon atoms of a cosmetically active component, a care substance, fragrance, lubricant or microbicide R-OH. The cyanoacrylates mentioned in the context of the present invention having the general formula I have, as radical R, for example, an optionally substituted hydrocarbon radical to which is derived from a fragrance alcohol R-OH. As "fragrance alcohols" are in the present context refers to compounds that are commonly used to improve the odor of technical products or for improving the odor of intended for consumer products. The term "fragrance alcohol" encompasses in particular those compounds which have at ambient pressure, in particular at a pressure of 101.3 kPa, a boiling point of more than 80 ° C, especially more than about 90 or greater than about 100 ° C. In a further preferred embodiment of the present invention the term "fragrance alcohols" refers to compounds having a boiling point higher than about 110 ° C, more than 120 ° C or more than 130 ° C under the above conditions. 3,5,6,6-tetramethyl-4-methyleneheptane-2-ol, 2-trans-6-cis-nonadien-1-ol, geraniol, nerol, linalool, myrcenol, lavandulol, citronellol, trans-trans-farnesol, trans- nerolidol, dihydromyrcenol, tetrahydrogeraniol, tetrahydrolinalool, 3,7-dimethyl-7-methoxyoctane-2-ol, (-) - menthol, (+) - neomenthol, (+) - lsomenthol, (+) - neoisomenthol, (- ) -lsopulegol, (+) - Neoisopulegol, (+) - lsoisopulegol, (+) - Neoisoisopulegol, α-terpineol, 1-terpinen-4-ol, (-) - borneol, (+) - lsobomeol, 2- methyl 4- (2,2,3-trimethyl-3-cyclopenten-1-yl) butanol, 2, methyl-4- (2,2,3-trimethyl-3-cyclopenten-1-yl) -2-buten-1 ol, 5- (2,2,3-trimethyl-3-cyclopenten-1-yl) -3-methyl-pentan-2-ol, 2-ethyl-4- (2,2,3-trimethyl-3-cyclopenten 1-yl) -2-buten-1-ol, 3-methyl-5- (2,2,3-trimethyl-3-cyclopenten-1-yl) -4-penten-2-ol, 3,3-dimethyl -5- (2,2,3-trimethyl-3-cyclopenten-1-yl) -4-penten-2-ol, 3-trans-lsocamphylcyclohexanol, 1- (2,2,6-trimethylcyclohexyl) hexan-3- oI, 2,5,5-trimethyl-1, 2,3,4,4a, 5,6,7-octahydronaphthalene-2-ol, benzyl alcohol, 2-Phe nylethylalkohol, 1-phenylethyl alcohol, 3-phenylpropanol, 2,2-dimethyl-3- (3-methylphenyl) propanol, 1-phenyl-2-methyl-2-propanol, 4-phenyl-2-methyl-2-butanol , 2-methyl-5-phenylpentanol, 3-methyl-5-phenyl pentanol, 1-phenyl-3-methyl-3-pentanol, 3-phenyl-2-propen-1-ol, phenoxyacetic acid 2-propenyl ester, 2 -lsopropyl-5-methyl phenol, 2-methoxy-4- (1 -propenyl) phenol, 2-methoxy-4-allylphenol, 4-methoxybenzyl, 4-hydroxy-3-methoxybenzaldehyde, 3-ethoxy-4-hydroxybenzaIdehyd, 4- (4-hydroxyphenyl) -2-butanone, methyl salicylate, isoamyl salicylate, hexyl salicylate, cis-3-hexenyl salicylate, cyclohexyl salicylate, benzyl salicylate, Phenethylsalicylat, ethyl vanillin, Hexahydromethyljonon, Hydroxymethylpentylcyclohexylaldehyd, isocamphylcyclohexanol, linalool or 1 -menthol. In another embodiment of the present invention, the radical R is derived from a lubricant of the general formula R-OH. As "lubricants" are referred to compounds within the scope of the present text, which show on a surface of a non-stick effect. Such compounds are useful, for example in detergents, as for example, when subsequent to washing, ironing a textile provide improved lubricity of the iron. In the present invention, suitable lubricants of the general formula R-OH silicone alcohols are for example suitable. In another embodiment of the present invention, the radical R is derived from a microbicide of the general formula R-OH. Suitable microbicides are, for example, thymol or menthol or mixtures thereof. The preparation of the cyanoacrylate ester according to the invention can in principle by conventional esterification or acidic Umesterungsmethoden as they are known in the art, in general, take place. Preferably cyanoacrylate to the invention are, however, obtained by particularly gentle, transition metal Umesterungsmethoden. Particularly suitable are, for example, by Seebach et al. in Synthesis, Communications, February 1982, pp 138 - described transesterification 141st The object of the literature described is considered part of the disclosure of the present text. The abovementioned compounds of the general formula I are suitable for the preparation of polymers. 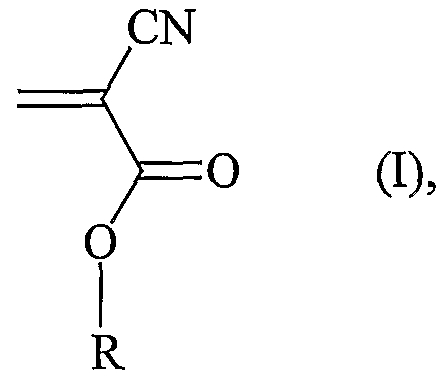 Cyanoacrylates polymerize usually already in the presence of nucleophilic compounds. The polymerization of cyanoacrylates is known in the art. In principle, however, all the other free-radical or anionic usually for the polymerization of compounds having at least one olefinic unsaturated double bond can be employed polymerization process for preparing polymers of the compounds of general formula I suitable. The present invention therefore also provides a polymer prepared using a compound of general formula I. In an inventive polymers can, for example, a polymer that was prepared using only a single type of compounds of general formula I, that is a homopolymer. However, it is also contemplated within the present invention that a polymer according to the invention using two or more different monomers of the general formula I was prepared. The different monomers can in this case be arranged randomly or in blocks within the polymer chain. Cyanopropyl, cyanobutyl or Cyanoisobutylacrylat used. The polymers or copolymers of the invention can be used as part verschiedenster applications either alone or in a mixture with another polymer or a mixture of two or more other polymers. The present invention therefore also provides a polymer blend comprising an inventive polymer and at least one further polymer. Suitable further polymers are in principle all polymers which are suitable according to the invention with a polymer or a mixture of two or more thereof to achieve its purpose. In a preferred embodiment, a polymer mixture of the invention contains a mixture of one or, that is, give more polymers according to the invention and one or more other polymers that are substantially compatible with each other substantially domain-free blends. Therefore, the object of the present invention relates not only nano- or microcapsules prepared exclusively using a monomer according to the invention. The present invention also relates to nano- or microcapsules using a mixture of two or more monomers of the general formula I according to the invention or by using a mixture of one or more monomers of the general formula I and at least one further monomer which is not generally carried out under the formula I precipitates were obtained. The nano- or microcapsules of the invention can in principle be prepared by any of interfacial polymerization. A particularly suitable polymerisation is for example described in FR 2515960, to which particular reference is made here and the production of nano- or microcapsules disclosed therein is considered to be part of the disclosure of the present text. The nano- or microcapsules of the invention have a capsule wall thickness of about 20 to about 200 nm, preferably from about 50 to about 100 nm. The nano- or microcapsules of the invention have the advantage that, if they are used for example as a support for a perfume capable of releasing fragrances because of their content modified cyanoacrylates already without destroying the capsule and or complete release of the capsule contents. A release of fragrances for example, by ester hydrolysis, in which the groups attached to the one prepared with the participation of a compound of general formula I polycyanoacrylate ester of a perfume alcohol released. Corresponding advantages also arise with the use of modified with microbicides or lubricants cyanoacrylates. Such an effect is particularly desirable if nano or the inventive microcapsules are used in washing or cleaning agents or cosmetics. Typical examples of washing, rinsing and cleaning agents which may be suitable for the purposes of the invention are solid detergent in powder, granule or extrudate form, liquid detergents, textile softeners, hand dishwashing detergents, machine dishwashing detergents, rinse aids, as well as universal, household and sanitary cleaners. Under the terms of washing, rinsing and cleaning agents but also those compositions which, rinsing or cleaning process for textiles or surface care, for example, be used to follow up on a washing fall within the scope of the present invention. Such compositions are, for example, fabric softeners, rinse aids or abrasives. Typical examples of personal care agents are soaps, shower gels or hair treatment agents, especially shampoos, hair rinses, hair treatments, hair-end fluids, colorants oderWellotionen. A "nano- or micro-capsule" is a capsule is understood in the context of the present invention, which comprises a capsule shell and a capsule content. The capsule shell of a nano- or microcapsule according to the invention contains at least a polycyanoacrylate, which was prepared by using a compound of general formula I. A nano- or microcapsule according to the invention preferably has a particle size, which is located with respect to the human visual or sensory perception below the visibility or Tastbarkeitsschwelle. Suitable are, in this case, for example, nano- or micro-capsules whose size is about 0.01 to about 40 microns, in particular from about 0.05 to about 10 microns. In a preferred embodiment of the present invention, the particle size of a nano- or microcapsule according to the invention about 0.1 to about 5 microns by weight, more preferably about 0.3 to about 3 or about 0.5 to about 1, 5 .mu.m. applies to the whole of the nano- or microcapsules according to the invention here is that the mean particle size, expressed as a d50 value, commonly referred to, is located within one of the abovementioned ranges. As a measuring method for the average particle size in the nano- or microcapsules according to the invention, the measurement methods conventionally used for the particles within this size ranges, for example, dynamic light scattering, laser diffractometer or Coulter Counter are suitable. While the use of nano invention or microcapsules in washing or cleaning agents or cosmetics have the above advantages, it can be in the context of the present invention, however, already then benefits achieved when present in a detergent or cleaning agent or a personal care nano- or microcapsules whose capsule shell contains at least one Polycyanacrylatester. Such nano- or microcapsules, which are filled with an active ingredient, in particular a perfume, exhibit a prolonged with regard to the effect of the ingredient efficacy compared to washing, cleaning or personal care products, which contain the active ingredient in non-encapsulated form. In addition, it has been found that the active substance yield in view of the adhesion to the treated substrate as compared to non-encapsulated active agents is considerably increased. A nano- or microcapsules according to the invention of the present active substance may for example be in the form of a liquid. If a drug is to be used in an inventive nano- or microcapsule, or in a nano- or microcapsule, as described as a component of a composition according to the invention hereinafter is in solid form, then such active ingredient may for example be dissolved in a carrier oil. Suitable carrier oils are, for example, triglycerides such as Miglyol 812N, silicone oils or paraffin oils. The present invention therefore also provides an active detergent or cleaning composition or a personal care composition, at least comprising an anionic surfactant or a mixture of two or more such surfactants or a cationic surfactant or a mixture of two or more of such surfactants and a nano- or microcapsule comprising a capsule shell and a capsule content, or a mixture of two or more such nano- or microcapsules, wherein the capsule shell contains at least one Polycyanacrylatester and the capsule contents least one active ingredient. The term "active ingredient" of a substance or a mixture of two or more substances is understood in the context of the present invention are not, or not exclusively during the washing, cleaning or maintenance operation to take effect. For example, a nano- or microcapsule , as used in the present invention contain a compound that is also present in nichtτverkapselter form in the washing, cleaning or care products, however, there develops no associated directly with the washing or cleaning action effect. Examples of such agents are fragrances , but have that may be present in a washing, cleaning or care agent both in encapsulated and in non-encapsulated form no direct washing, cleaning or care effect. This is not precluded that such active substance optionally dissolved in a carrier oil is present, which, in turn, play an active role in a washing, cleaning or does care process. An inventive washing or cleaning composition or a personal care composition comprises at least one anionic surfactant in the context of a particular embodiment of the present invention. Anionic surfactants can be in the context of the methods of the invention in addition to the nano- or microcapsules the only component of the inventive compositions. However, it is also possible within the scope of the present invention that the inventive compositions comprise an anionic surfactant or a mixture of two or more anionic surfactants together with one or more nonionic surfactants. Suitable anionic surfactants are in principle all anionic surfactants, which are customarily used in detergents or cleaners or body care compositions suitable in the context of the present invention. These compounds include, for example, anionic surfactants such as alkyl benzene sulfonates, olefin sulfonates, alkane sulfonates and alk (en) yl sulfates. 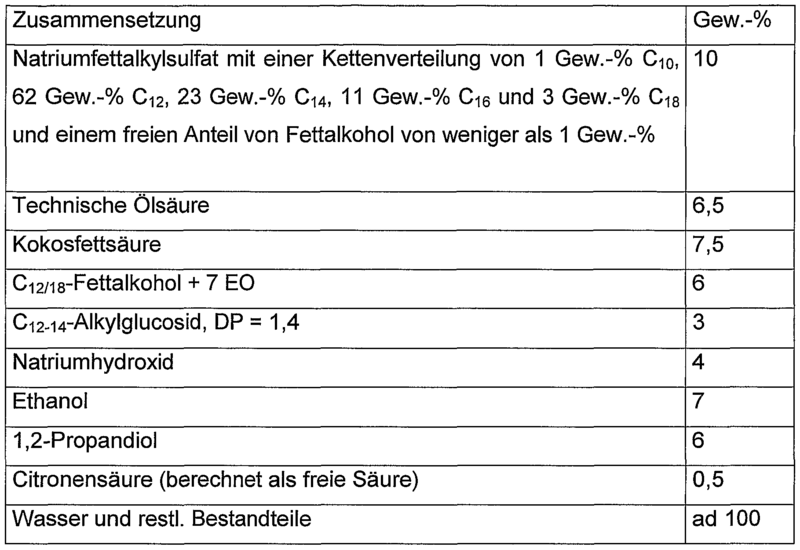 Alk (en) yl sulfates are the alkali and especially the sodium salts of Schwefelsäurehalbester the C 12 -C 8 fatty alcohols, for example coconut fatty alcohol, tallow fatty alcohol, lauryl, myristyl, - cetyl or stearyl alcohol, or the Cιo-C 20 oxo alcohols, and Halbester the secondary alcohols of this chain length. Further preferred are alk (en) yl sulfates of said chain length which contain a synthetic, linear alkyl chain based on a petrochemical and which exhibit similar degradation behavior to the corresponding compounds based on oleochemical raw materials. From the washing are the C 12 -Cι 6 alkyl sulfates and alkyl sulfates, and Cι 2 -Cι 5 Cι 4 -Cι preferably 5 alkyl sulfates. In addition, 2,3-alkyl sulfates, which are produced for example in accordance with US Patent No. 3,234,258 or 5,075,041 and can be obtained as commercial products from Shell Oil Company under the name DAN ® are useful as components of the compositions according to the invention. It may also be of particular advantage, especially for machine detergents, to advantage, Cι 6 -Cι yl sulfates 8 -alk (s) in combination with low-melting anionic surfactants and, in particular with such anionic surfactants, having a low force point and at relatively low washing temperatures, for example, room temperature to 40 ° C show a low crystallization tendency to use. In a preferred embodiment of the present invention, particularly when the compositions of the invention are to be used as detergents, the anionic surfactants used comprise mixtures of short chain and long-chain fatty alkyl sulfates, preferably mixtures of C-ι 2 -Cι -Fettalkylsulfaten or C-ι 2 - Cι Cι 4 -Fettalkylsulfaten and 6 - Ci 8 -Fettalkylsulfaten and in particular Cι 2 -C 6 -Fettalkylsulfaten and Ciβ-C-iβ- fatty alkyl sulfates. Further, as anionic surfactants, for example anionic surfactants more suitable of the sulfonate and sulfate in the present invention. Suitable surfactants of the sulfonate type are preferably C9.13- alkyl benzene sulfonates, olefin sulfonates, ie mixtures of alkene and hydroxyalkane sulfonates and disulfonates, as obtained, for example from Cι 2 _i 8 monoolefins with an internal or terminal double bond by sulfonation with gaseous sulfur trioxide and subsequent alkaline or acidic hydrolysis of the sulfonation products. Also suitable are alkanesulfonates, which are obtained from Cι _ 2 18 alkanes, for example by sulfochlorination or sulfoxidation and subsequent hydrolysis or neutralization. Likewise, the esters of 2-sulfofatty acids (ester sulfonates), for example, are suitable for the 2-sulfonated Methylester of hydrogenated coconut, palm kernel or tallow fatty acids as anionic surfactants. Other suitable anionic surfactants are sulfonated Fettsäureglycerinester. Under Fettsäureglycerinestem the mono-, di- and triesters and mixtures thereof are to be understood as they are obtained in the production by esterification of a monoglycerol with 1 to 3 mol fatty acid or in the transesterification of triglycerides with 0.3 to 2 moles of glycerol. Preferred sulfonated Fettsäureglycerinester are the sulfonation products of saturated fatty acids having 6 to 22 carbon atoms, for example caproic acid, caprylic acid, capric acid, myristic acid, lauric acid, palmitic acid, stearic acid or behenic acid. 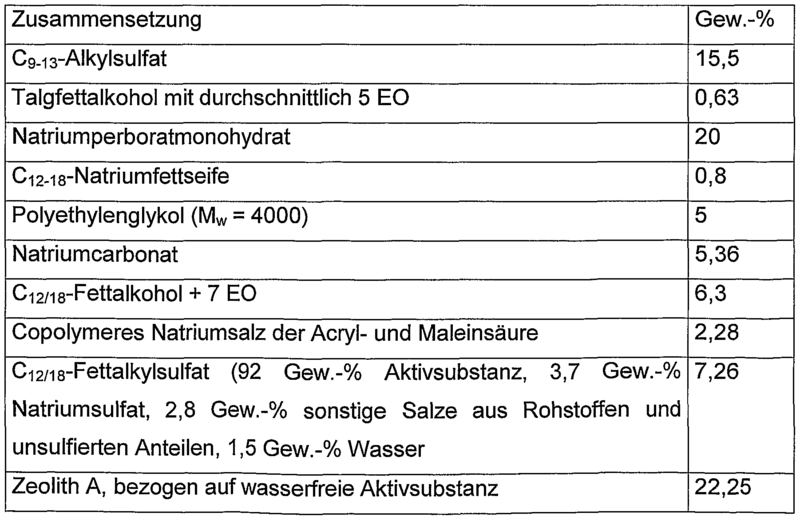 Also, the Schwefelsäuremonoester the ethoxylated with 1 to 6 moles of ethylene oxide, linear or branched C 7 .2i-alcohols such as 2-methyl-branched C. 9 1 1- alcohols containing on average 3.5 mol ethylene oxide (EO) or Cι 2 _ι 8 fatty alcohols containing 1 to 4 EO, are useful in this invention as a component of the inventive compositions. They are used only in relatively small amounts, for example in quantities of 1 to 5 wt .-% in detergents due to their high foaming. Other suitable as a component of the present compositions anionic tensides the salts of alkylsulfosuccinic acid, which are also known as sulfosuccinates or as sulfosuccinic acid esters and the Monoester and / or diesters of sulfosuccinic acid with alcohols, preferably fatty alcohols and especially ethoxylated fatty alcohols are represented. Preferred sulfosuccinates contain C 8 -i 8 fatty alcohol residues or mixtures thereof. Particularly preferred sulfosuccinates contain a fatty alcohol radical derived from ethoxylated fatty alcohols which, considered in isolation, represent nonionic surfactants (see description below). Of these sulfosuccinates whose fatty alcohol radicals are derived from ethoxylated fatty alcohols with a narrow homolog distribution are particularly preferred. Likewise, it is also possible to use alk (en) yl succinic acid preferably containing 8 to 18 carbon atoms in the alk (en) yl chain or salts thereof. As further within the scope of the present invention as part of the compositions of the invention particularly suitable anionic surfactants are soaps. Saturated fatty acid soaps such as the salts of lauric acid, myristic acid, palmitic acid, stearic acid, hydrogenated erucic acid and behenic acid, and in particular from natural fatty acids, for example coconut, palm kernel or tallow soap mixtures derived. The above-mentioned anionic surfactants, including the soaps, may be present in the inventive compositions in the form of their sodium, potassium or ammonium salts and as soluble salts of organic bases such as mono-, di- or triethanolamine. Preferably, the anionic surfactants mentioned are present in the inventive compositions in the form of their sodium or potassium salts, in particular in the form of sodium salts. In a further embodiment of the invention, the inventive compositions comprise the surfactants in the form of their magnesium salts. In the selection of the anionic surfactants which may be used in the inventive compositions, the formulation freedom are no restrictions in the way substantially. The skilled worker is aware of relevant terms in the field of washing, cleaning or maintenance products. In a further preferred embodiment of the present invention, an active detergent or cleaning composition or a personal care composition of the invention contains at least one cationic surfactant. Cationic surfactants can be in the context of the inventive method in addition to the nano- or microcapsules the only component of the inventive compositions. However, it is also possible within the scope of the present invention that the inventive compositions comprise a cationic surfactant or a mixture of two or more cationic surfactants together with one or more nonionic surfactants. As cationic surfactants, for example, the esterquats are suitable in the context of the present invention as a component of the inventive compositions. The term "esterquats" fatty acid are generally understood quaternized. These are known substances which may be obtained by the relevant methods of preparative organic chemistry. In this connection, reference is made to International patent application WO 91/01295 (Henkel) after which triethanolamine is partly esterified in the presence of hypophosphorous acid with fatty acids, air is passed through and then quaternized with dimethyl sulfate or ethylene oxide. Representing the extensive prior art, at this point on the documents US 3,915,867, US 4,370,272, EP-A2 0 239 910, EP A2 0293955 A2, EP-A2 0,295,739 and EP-A2 0,309,052 A2 directed. overviews on this subject, for example, of O.Ponsati in CR CED Congress, Barcelona, ​​1992, p.167, R. Puchta et al. in Tens.Surf.Det, 30, 186 (1993), M. Brock in Tens. Surf. Det. 30, 394 (1993) and R.Lagerman et al. in J.Am.Oil. Chem .Soα, 71, 97 (1994) published. in which R 1 CO is an acyl group containing 6 to 22 carbon atoms, R 2 and R 3 independently represent hydrogen or R 1 CO, R is an alkyl radical having 1 to 4 carbon atoms or a (CH 2 CH 2 0) q H group , m, n and p together stand for 0 or numbers of 1 to 12, q is a number from 1 to 12 and X is halide, alkyl sulfate or alkyl phosphate. Typical examples of esterquats which may be used in accordance with the invention are products based on caproic acid, caprylic acid, lauric acid, palmitic acid, isostearic acid, stearic acid, oleic acid, elaidic acid, behenic acid and erucic acid and technical mixtures obtained, for example in the pressure hydrolysis of natural fats and oils. Preferably technical Cι 2 / i 8 cocofatty acids and, in particular partly hydrogenated Ciβ tallow or palm oil fatty acids and Ci-elaidic be employed 6/18 -fatty acid. For the preparation of the esterquats fatty acids and the triethanolamine in a molar ratio of 1 1 may: be used 1: 1 to. 3 In view of the performance properties of the esterquats in mind, a ratio of 1, 2: 1 to 2.2: 1, preferably 1, 5: 1 to 1: 9, proved 1 be particularly advantageous. The preferred esterquats are technical mixtures of mono-, di- and triesters with an average degree of esterification of 1, 5-1, 9 and are derived from technical C1 6 / 18- Talgbzw. Palm fatty acid (iodine number 0 to 40) from. From a performance point of view, quaternized Fettsäuretriethanol- have aminestersalze of formula (II) proved particularly advantageous, in which R is an acyl group having 16 to 18 carbon atoms; R 2 is R CO, R 3 is hydrogen, R 4 is a methyl group, m , n and p is 0 and X is methyl sulfate. R 5 in which R 1 CO is an acyl group containing 6 to 22 carbon atoms, R 2 is hydrogen or R 1 CO, R 4 and R 5 are independently alkyl of 1 to 4 carbon atoms, m and n together stand for 0 or numbers of 1 to 12 and X stands for halide, alkyl sulfate or alkyl phosphate. 1 9 in which R 'is an acyl group containing 6 to 22 carbon atoms, R ^ is hydrogen or R CO, R, R and R independently of one another are alkyl groups containing 1 to 4 carbon atoms, m and n together stand for 0 or numbers of 1 is up to 12 and X is halide, alkyl sulfate or alkyl phosphate. With regard to the choice of the preferred fatty acids and the optimal degree of esterification, the examples mentioned for (II) are (IM) for the esterquats corresponding to formulas (IV). The esterquats are normally in the form of 50 to 90% by weight solutions in alcohol trade that can readily be diluted with water if necessary. 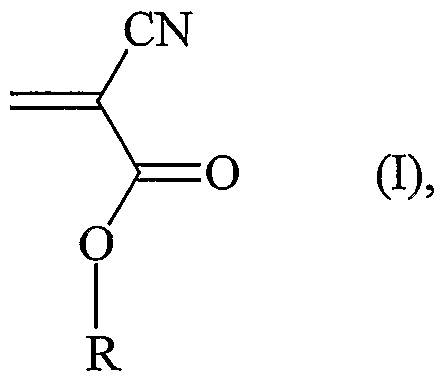 Further examples of the usable in the inventive compositions cationic surfactants are especially quaternary ammonium compounds. Ammonium are preferred such as alkyl, dialkyl and trialkyl such. As cetyltrimethylammonium chloride, stearyltrimethylammonium, Distearyldi- methyl ammonium chloride, lauryl, Lauryldimethylbenzyl- ammonium chloride and tricetylmethylammonium chloride. Further inventively usable cationic surfactants are the quaternized protein hydrolysates. According to the invention are also suitable cationic silicone oils such as the commercially available products Q2-7224 (manufacturer: Dow Corning; a stabilized trimethylsilylamodimethicone), Dow Corning 929 Emulsion (containing a hydroxylamino-modified silicone which is also known as amodimethicone), SM -2059 (manufacturer: General Electric), SLM-55067 (manufacturer Wacker) and AbilR-Quat 3270 and 3272 (manufacturer: Th. Goldschmidt; diquaternary polydimethylsiloxanes, quaternium-80). Alkylamidoamine, particularly fatty acid as the stearylamidopropyldimethylamine obtainable under the name Tego AmidRS 18, are characterized by a good conditioning effect particularly by their good biodegradability. An example of a suitable cationic surfactant quaternary sugar derivative is the commercially available product Glucquat R 100 represents, according to CTFA nomenclature a "lauryl methyl Gluceth-10 Hydroxypropyl Dimonium Chloride". The proportion of cationic surfactants in the compositions of this invention is for example up to about 30 wt .-%, for example about 1 to about 20.0 wt .-%. Also suitable as a component of the inventive compositions are ampholytic surfactants or betaine. Betaines are known surfactants which mainly produced by carboxyalkylation, preferably carboxymethylation, of amine compounds are prepared. Preferably, the starting materials with halocarboxylic acids or their salts, in particular condensed with sodium chloroacetate, one mole of salt being formed per mole of betaine. Furthermore, the addition of unsaturated carboxylic acids such as acrylic acid is possible. Concerning the nomenclature and in particular the distinction between betaines and "true" amphoteric 373 (1982) was the contribution of U. Ploog in Seifen-Ole-Fette waxes, 198 were referred. Other reviews of this subject can be found, for example, by A. O'Lennick et al. in HAPPI, Nov. 70 (1986), pp Holzman et al. in Tens. Det. 23, 309 (1986), R. Bibo et al. in Soap Cosm. Chem. Spec. Apr. 46 (1990) and P. Ellis et al. in Euro Cosm. 1, 14 (1994). in which R 1 is alkyl and / or alkenyl groups containing 6 to 22 carbon atoms, R 2 is hydrogen or alkyl of 1 to 4 carbon atoms, R 3 is alkyl of 1 to 4 carbon atoms, n is a number of 1 to 6 and X is an alkali and / or alkaline earth metal or ammonium. Typical examples are the carboxymethylation products of hexylmethylamine, hexyldimethylamine, octyldimethylamine, decyldimethylamine, dodecylmethylamine, dodecyldimethylamine, Dodecylethylmethylamin, Cι 2 / ι -Kokosalkyldimethylamin, myristyldimethylamine, cetyldimethylamine, stearyldimethylamine, Stearylethyl- methyl amine, oleyl dimethyl amine, Ci 6/18 tallow alkyl dimethyl amine and technical mixtures thereof. R 2 R 4 CO-NH- (CH 2) m -N (CH 2) n COOX (VI) in which R 4 CO is an aliphatic acyl radical having 6 to 22 carbon atoms and 0 or 1 to 3 double bonds, m is a number protrudes from 1 to 3 and R 2, R 3, n and X have the meanings given above. Typical examples are reaction products of fatty acids having 6 to 22 carbon atoms, including caproic acid, caprylic acid, capric acid, lauric acid, myristic acid, palmitic acid, palmitoleic acid, stearic acid, isostearic acid, oleic acid, elaidic acid, petroselinic acid, linoleic acid, linolenic acid, elaeostearic acid, arachidic acid, gadoleic acid, behenic acid and erucic acid as well as technical mixtures thereof aminopropylamine with N, N-dimethylaminoethylamine, N, N-dimethylaminopropylamine, N, N-diethylaminoethylamine and N, N-diethyl, which are condensed with sodium chloroacetate. Preferred is the use of a condensation product of Cs / i 8 coconut oil fatty acid-N, N-dimethylaminopropylamide with sodium chloroacetate is. 5 is an alkyl group having 5 to 21 carbon atoms, R 6 in which R represents a hydroxyl group, an OCOR 5-5 group and m stands for 2 or NHCOR or third These substances are known substances, which can be obtained, for example, by cyclizing condensation of 1 or 2 moles of fatty acid with polyfunctional amines such as for example aminoethylethanolamine (AEEA) or diethylenetriamine. The corresponding carboxyalkylation products are mixtures of different open-chain betaines. Typical examples are condensation products of the above mentioned fatty acids with AEEA, preferably imidazolines based on lauric acid or coconut oil fatty acid, in turn, C 12 1, which are subsequently betainized with sodium chloroacetate. In cases where there is detergent in the compositions of this invention, the inventive compositions comprise in their entirety usually one or more of the above surfactant (s) in total quantities of in total 5 to 50 wt .-%, preferably in amounts of 10 to 35 wt .-%. , The inventive detergent or cleaning composition or the inventive compositions for body care, in addition to an anionic surfactant, or mixture two or more anionic surfactants or a cationic surfactant, or a blend from two or more cationic surfactant, or a blend of one or more anionic and a or more cationic surfactants, also a nonionic surfactant or a mixture of two or more nonionic surfactants. may be as nonionic surfactants, for example alkoxylated, advantageously ethoxylated, more especially primary alcohols preferably containing 8 to 18 carbon atoms and on average 1 to 12 moles of ethylene oxide (EO) per mole of alcohol some of whose alcohol residue, methyl-branched linear or preferably in the 2-position or . linear and methyl-branched radicals may contain the mixtures typically present in oxoalcohol radicals. However, especially preferred as a constituent of the inventive compositions, alcohol ethoxylates with linear radicals of alcohols of native origin with 12 to 18 carbon atoms, for example coconut, palm, tallow fat or oleyl alcohol, and preferably on average 2 to 8 EO per mole of alcohol. Preferred ethoxylated alcohols include, for example, Cι 2 .ι alcohols with 3 EO or 4 EO, n-alcohol with 7 EO, C. 13 15 - alcohols containing 3 EO, 5 EO, 7 EO or 8 EO, C 12 _ι 8 alcohols containing 3 EO, 5 EO or 7 EO and mixtures thereof, and mixtures of 2 Cι .ι alcohol with 3 EO and Cι 2 .i 8 alcohol containing 5 EO. The degrees of ethoxylation mentioned are statistical averages which may be an integer or a fractional number for a specific product. Preferred alcohol ethoxylates have a narrow homolog distribution (narrow range ethoxylates, NRE). In addition to these nonionic surfactants, fatty alcohols containing more than 12 EO may also be used. Examples are tallow fatty alcohol containing 14 EO, 25 EO, 30 EO or 40 EO. Another class of preferred as part of the compositions of this invention nonionic surfactants which are used either as sole nonionic surfactant or in combination with other nonionic tensides are alkoxylated, preferably ethoxylated or ethoxylated and propoxylated fatty acid alkyl ester, preferably having 1 to 4 carbon atoms in the alkyl chain, in particular fatty acid methyl ester, as described for example in Japanese patent application JP 58/217598 or which are preferably produced by the process described in the international patent application WO-A-90/13533 method. Another class of nonionic surfactants which can be used advantageously as part of the compositions of the invention are the alkyl polyglycosides (APG). Suitable alkyl polyglycosides correspond to the general formula R0 (G) 2, where R is a linear or branched, methyl-branched, more particularly 2-position, saturated or unsaturated, aliphatic radical having 8 to 22, preferably 12 to 18 C-atoms and G symbol, which stands for a glycose unit containing 5 or 6 carbon atoms, preferably glucose. The degree of glycosidation z is between 1, 0 and 4.0, preferably between 1 0 and 2.0 and in particular between 1, 1 and 1; 4. Preference is given to linear alkyl polyglucosides, ie alkyl polyglycosides in which the polyglycosyl a glucose unit and the alkyl group is an n-alkyl radical. The compositions of the invention may include alkyl polyglycosides, wherein a content of the compositions according to the invention APG of more than 0.2 wt .-%, based on the entire composition of the invention is preferred. As active detergent or cleaning compositions include compositions suitable, for example, APG in amounts of 0.2 to 10 wt .-% or from 0.2 to 5 wt .-% or in amounts of from 0.5 to 3 wt .-%. And anionic surfactants of the amine oxides, e.g., N-N cocoalkyl-N-N-tallow alkyl dimethylamine oxide and N-, N-dihydroxyethylamine, and are useful as fatty acid part of the inventive detergent or cleaning compositions. The proportion of these nonionic surfactants in the compositions of this invention is a total of preferably no more than that of the ethoxylated fat alcohols, especially not more than half of them. in which RCO is an aliphatic acyl radical having 6 to 22 carbon atoms, R 1 represents hydrogen, an alkyl or hydroxyalkyl having 1 to 4 carbon atoms and [Z] is a linear or branched polyhydroxyalkyl radical having 3 to 10 carbon atoms and 3 to 10 hydroxyl groups. The polyhydroxyfatty acid amides are known substances which can be obtained with a fatty acid, a fatty acid or a fatty acid chloride by reductive amination of a reducing sugar with ammonia, an alkylamine or an alkanolamine and subsequent acylation. in which R is a linear or branched alkyl or alkenyl group having 7 to 12 carbon atoms, R 1 is a linear, branched or cyclic alkyl group or an aryl group containing 2 to 8 carbon atoms and R 2 is a linear, branched or cyclic alkyl group or an aryl group or an oxyalkyl group having 1 to 8 carbon atoms, wherein Cι- 4 alkyl or phenyl groups being preferred, and [Z] is a linear polyhydroxyalkyl residue, whose alkyl chain is substituted with at least two hydroxyl groups, or alkoxylated, preferably ethoxylated or propoxylated derivatives of that group. The rest [Z] is preferably obtained by reductive amination of a reduced sugar, for example glucose, fructose, maltose, lactose, galactose, mannose or xylose. The N-alkoxy- or N-aryloxy-substituted compounds can then for example, according to the teaching of the International Application WO-A- 95/07331 'by reaction with fatty acid methyl ester in the presence of an alkoxide as catalyst, be converted into the required polyhydroxyfatty. In addition to the aforementioned surfactants, a composition according to the invention, provided that this is a detergent or cleaning agent, also contain builders. As a component of the inventive compositions, provided these are washing or cleaning agents, are amorphous sodium silicates with an Na 2 0: Si0 2 of 1: 2 to 1: 3.3, preferably 1: 2 to 1: 2 , 8 and in particular from 1: 2 to 1: 2.6 which dissolve with delay and exhibit multiple wash cycle properties, can be used. The delay in dissolution in relation to conventional amorphous sodium silicates can have fiction in various ways, for example by surface treatment, compounding, KompaktierungΛ or have been caused by overdrying. In the context of this invention is also meant "X-ray", the term "amorphous". This means that the silicates ray diffraction experiments, provide no sharp X-ray reflexes typical of crystalline substances, but at best one or more maxima of the scattered X-radiation which have a width of several degrees of the diffraction angle. However, it may very well even lead to particularly good builder properties if the silicate particles produce crooked or even sharp diffraction maxima in electron diffraction experiments. This may be interpreted so that the products have microcrystalline regions the size of 10 to several hundred nm, with values ​​up to max. 50 nm and especially up to max. 20 nm are preferable. Such X-ray amorphous silicates, which also dissolve with delay in relation to conventional waterglasses, are described for example in German patent application DE-A-44 00 024th Particularly preferred for use in the present invention are compressed / compacted amorphous silicates, compounded amorphous silicates and overdried X-ray amorphous silicates. can be described. Suitable zeolites have a mean particle size of less than 10 .mu.m (volume distribution; measurement method: Coulter Counter) and preferably contain 18 to 22 wt .-%, in particular 20 to 22 wt .-% of bound water. In the present invention, the generally known phosphates may be used. Particularly suitable are the sodium salts of the orthophosphates, the pyrophosphates and especially the tripolyphosphates. As organic builders and thus are also suitable as a component of compositions of the invention are for example usable in the form of their sodium salts polycarboxylic acids, polycarboxylic acids being understood to be carboxylic acids which carry more than one acid function. Examples of these are citric acid, adipic acid, succinic acid, glutaric acid, malic acid, tartaric acid, fumaric acid, sugar acids, amino carboxylic acids, nitrilotriacetic acid (NTA), provided their use is not objectionable on ecological grounds, and mixtures thereof. Preferred salts are the salts of polycarboxylic acids such as citric acid, adipic acid, succinic acid, glutaric acid, tartaric acid, sugar acids and mixtures thereof. The acids per se can be used. The acids Besides their builder effect also typically have the property of an acidifying component and, hence, also serve to establish a relatively low and mild pH value in detergents and cleaning composition portions. In particular, citric acid, succinic acid, adipic acid, gluconic acid and mixtures of these of these in this context. Also suitable as a component of the compositions of the invention are polymeric polycarboxylates. These are for example the alkali metal salts of polyacrylic acid or polymethacrylic acid, for example those having a relative molecular mass of 500 to 70,000 g / mol. At the indicated for polymeric polycarboxylates molecular weights are within the scope of the present invention to the weight average molecular weight (M w) of the particular acid form which (GPC) were determined by gel permeation chromatography using a UV detector was used. The measurement was made against an external polyacrylic acid standard, which owing to its structural similarity to the polymers under investigation, provides realistic molecular weight. These figures differ significantly from the molecular weights measured against polystyrene sulfonic acids as standard. The measured against polystyrene acids molecular weights are significantly higher than the molecular weights mentioned in the context of the present invention generally. are useful as constituents of the compositions according to the invention copolymeric polycarboxylates, especially those of acrylic acid with methacrylic acid or of acrylic acid or methacrylic acid with maleic acid. Particularly suitable copolymers of acrylic acid with maleic acid which contain from 50 to 90 wt .-% acrylic acid and 50 to 10 wt .-% of maleic acid. Their relative molecular weight, based on free acids, is generally from 2000 to 70,000 g / mol, preferably 20,000 to 50,000 g / mol, and especially 30,000 to 40,000 g / mol. The content of the compositions of the invention (co) polymeric polycarboxylates is preferably about 0.5 to about 20 wt .-%, in particular about 3 to about 10 wt .-%. To improve water solubility, suitable polymers can also be prepared using allyl sulfonic acids as monomer components, as described for example in EP-B 0727448, or may have been manufactured using allyloxybenzenesulfonic acid and methallyl sulfonic acid as monomer. Biodegradable polymers of more than two different monomer units, for example, those according to DE-A 43 00 772, as monomers, salts of acrylic acid and maleic acid and vinyl alcohol or vinyl alcohol derivatives, or according to DE-C 42 21 381 as monomers, salts of acrylic acid and 2-alkylallyl sulfonic acid and sugar derivatives, are useful as components of the compositions according to the invention. Other suitable as components of the compositions of the invention copolymers are those that are described in German patent applications DE-A 43 03 320 and DE-A 44 17 734 and contain as monomer units preferably contain acrolein and acrylic acid / acrylic acid salts or acrolein and vinyl acetate. Likewise, are polymeric aminodicarboxylic acids, salts or precursors thereof as suitable components of compositions of the invention. Particularly preferably polyaspartic acids or their salts and derivatives, one of which is disclosed in the German patent application DE-A 195 40 086 to have a bleach-stabilizing effect besides their cobuilder properties. Other suitable ingredients of the compositions of the invention are polyacetals which may be obtained by reaction of dialdehydes with polyol having 5 to 7 carbon atoms and at least 3 hydroxyl groups, for example as described in European Patent Application EP-A 0 280 223.. Preferred polyacetals are obtained from dialdehydes such as glyoxal, glutaraldehyde, terephthalaldehyde and mixtures thereof and from polyol such as gluconic acid and / or glucoheptonic acid. Other suitable as components of the compositions of the invention organic builders are dextrins, for example oligomers or polymers of carbohydrates which may be obtained by partial hydrolysis of starches. The hydrolysis can be carried out by customary, for example acid- or enzyme-catalyzed methods. Preferably, hydrolysis products with average molecular weights ranging from 400 to 500,000 g / mol. A polysaccharide with a dextrose equivalent (DE) in the range of 0.5 to 40, especially from 2 to 30 is preferred, the DE being an accepted measure of the reducing effect of a polysaccharide by comparison with dextrose, a DE of soft 100 has. Both maltodextrins with a DE between 3 and 20 and dry glucose sirups with a DE of between 20 and 37 and also so-called yellow dextrins and white dextrins with relatively high molecular weights from 2,000 to 30,000 g / mol. A preferred dextrin is described in British Patent Application 94 19 091st The oxidized derivatives of such dextrins are their reaction products with oxidizing agents which are capable of oxidizing at least one alcohol function of the saccharide ring to the carboxylic acid function. Such oxidized dextrins and processes for their preparation are, in particular from European patent applications EP-A 0232202, EP-A 0427349, EP-A 0472042 and EP-A 0542496 and from International Patent Applications WO 92/18542 WHERE 93/08251, WO 93/16110, WO 94/28030, WO 95/07303, WO 95/12619 and WO 95/20608 known. Also suitable is an oxidized oligosaccharide according to German patent application DE-A 196 00 018. An oxidized to C 6 of the saccharide may be particularly advantageous. Oxydisuccinates and other derivatives of disuccinates, preferably ethylenediamine suitable co-builders and other suitable components of compositions of the invention are. Ethylenediamine-N, N'-disuccinate (EDDS), whose synthesis is described for example in the document US-A 3,158,615 is preferably used in the form of its sodium or magnesium salts. Furthermore, in this context, are also preferred glycerol disuccinates and glycerol, as described for example in US patents US-A 4,524,009 and US-A 4,639,325, in the European patent application EP-A 0,150,930 and in Japanese Patent Application JP-A 93 / 339.896 to be discribed. If zeolite in the inventive compositions and / or silicate-containing formulations are used, their content is in the above mentioned compounds at about 3 to about 15 wt .-%. Other useful organic co-builders and other suitable components of compositions of the invention are, for example, acetylated hydroxycarboxylic acids and salts thereof, which may optionally be present in lactone form and which contain at least 4 carbon atoms and at least one hydroxyl group and at most two acid groups. Such co-builders are described for example in international patent application WO 95/20029. Heavy metal binding capacity. Accordingly, it may particularly when washing or the inventive cleaner portions contain bleach be preferred aminoalkanephosphonates, in particular DTPMP, or mixtures of said phosphonates to use. In addition, all compounds which are capable of forming complexes with alkaline earth metal ions are used as co-builders and thus as other suitable components of compositions of the invention can. Besides the constituents mentioned surfactant and builder compositions of the invention may, for example, further customary in detergents or cleaners ingredients from the group of the bleaches, bleach activators, enzymes, perfumes, perfume carriers, fluorescers, dyes, foam inhibitors, silicone oils, antiredeposition agents, optical brighteners, graying inhibitors, color transfer inhibitors and corrosion inhibitors. Said compounds can in the present invention, provided that the physical state and the chemical nature permit, for example, are each used individually in the process according to the invention. However, it is preferable in the invention, when compositions of the invention, the compounds mentioned in admixture with one or more contain the above-mentioned substances or substance types. Among the compounds used as bleaching agents in water H 2 0 2 compounds yielding sodium perborate tetrahydrate and sodium perborate monohydrate are particularly important. Other useful bleaching agents are, for example, sodium percarbonate, peroxypyrophosphates, citrate perhydrates and H 2 0 2 -yielding peracidic salts or peracids, such as perbenzoates, peroxophthalates acid Diperazelain-, Phthaloiminopersäure or diperdodecanedioic acid. Be cleaning or bleaching preparations made for automatic dishwashing, bleaching agents from the group of organic bleaching agents can be used. Typical organic bleaching agents are diacyl peroxides, such as dibenzoyl peroxide. Other typical organic bleaching agents are the peroxy acids being mentioned in particular as examples the alkyl and aryl peroxyacids. Preferred representatives are (a) phthalate peroxybenzoic acid and its ring-substituted derivatives such as alkylperoxybenzoic acids, but also peroxy-α-naphthoic acid and Magnesiummonoper-; (B) the aliphatic or substituted aliphatic peroxy acids, such as peroxylauric acid, peroxystearic acid, ε-phthalimidoperoxycaproic acid [Phthaloiminoperoxyhexansäure (PAP)], o-carboxybenzamido-peroxycapron- acid, N-nonenylamidoperadipic acid and N-nonenylamidopersuccinates; and (c) aliphatic and araliphatic peroxydicarboxylic acids, such as 1, 12-Diperoxy- carboxylic acid, 1, 9-diperoxyazelaic acid, Diperocysebacinsäure, Diperoxybrassyl- acid, the diperoxyphthalic acids, 2-decyldiperoxybutane-1, 4-dioic acid, N, N- terephthaloyldi (6-aminopercaproic acid). As bleaching agents in compositions which are to be suitable for machine dishwashing, and chlorine or bromine-releasing substances. Suitable chlorine- or bromine-releasing materials, for example, heterocyclic N-bromo and N-chloroamides, for example, trichloroisocyanuric acid, tribromoisocyanuric, dibromoisocyanuric and / or dichloroisocyanuric come (DICA) and / or their salts with cations such as potassium and sodium. Hydantoin compounds such as 1, 3-dichloro-5,5-dimethylhydantoin are also suitable. When the compositions of the invention are used in the preparation of a detergent, the compositions may comprise ingredients which exert an influence on the bleaching effect. In order to achieve, for example, when washing or cleaning at temperatures of 60 ° C and below, an improved bleaching effect, bleach activators can be incorporated into the compositions. Suitable bleach activators are compounds which, under perhydrolysis conditions produce aliphatic peroxocarboxylic acids preferably containing 1 to 10 carbon atoms, especially 2 to 4 carbon atoms, and / or optionally substituted perbenzoic acid, can be used. Suitable substances which carry O- and / or N-acyl groups of said number of carbon atoms and / or optionally substituted benzoyl groups. acylated alkylene diamines are preferred multiple, in particular tetraacetylethylenediamine (TAED), acylated triazine derivatives, especially 1, 5-diacetyl-2,4-dioxohexahydro-1, 3,5-triazine (DADHT), acylated glycolurils, in particular tetraacetylglycoluril (TAGU), N-acylimides, in particular N-nonanoylsuccinimide (NOSI), acylated phenol sulfonates, more particularly n- nonanoyl or isononanoyloxybenzenesulfonate (n- or iso-NOBS), carboxylic anhydrides, more particularly phthalic anhydride, acylated polyhydric alcohols, especially triacetin, ethylene glycol diacetate and 2,5- diacetoxy-2,5-dihydrofuran. In addition to the conventional bleach activators or instead of them, so-called bleach catalysts in the compositions of this invention can be incorporated. These substances are bleach-boosting transition metal salts or transition metal complexes such as Mn, Fe, Co, Ru - or Mo salt complexes or - carbonyl complexes. Also, Mn-, Fe-, Co-, Ru-, Mo-, Ti-, V- and Cu-complexes with nitrogen-containing tripod ligands and Co-, Fe-, Cu- and Ru-ammine complexes usable as bleach catalysts. Suitable enzymes are those from the class of proteases, lipases, amylases, cellulases and mixtures thereof in question. are especially well suited from bacterial strains or fungi such as Bacillus subtilis, Bacillus licheniformis and Streptomyces griseus Enzymatic active substances obtained. Preferably, proteases of the subtilisin type and especially proteases produced from Bacillus lentus. Enzyme mixtures, for example of protease and amylase or protease and lipase or protease and cellulase or of cellulase and lipase or of protease, amylase and lipase or protease, lipase and cellulase, but especially Cellulasehaltige mixtures of particular interest. Peroxidases or oxidases have also proven suitable in some cases. The enzymes may be adsorbed onto supports and / or encapsulated in membrane materials to protect them against premature decomposition. The proportion of enzymes, enzyme mixtures or enzyme granules in the present compositions can, for example, about 0.1 to 5 wt .-%, preferably 0.1 to about 2 wt .-%. The compositions of the invention contain other additives according to a particularly preferred embodiment, as are known from the prior art as additives for washing or cleaning agent preparations. An example of as a component of the inventive compositions, when used as a detergent or cleaning agent, usable additives are optical brighteners. can be used here, for example, the usual in detergents optical brighteners. Examples of such optical brighteners are derivatives of diaminostilbenedisulfonic acid or alkali metal salts. Suitable z. For example, salts of 4, 4'-bis (2-anilino-4-morpholinol, 3,5-triazinyl-6-amino) stilbene-2,2'-disulfonic acid or compounds of similar structure, instead of the morpholino group is a carry diethanol- amino group, a methylamino group, an anilino group or a 2- methoxyethylamino group. Brighteners may be included on the type of the substituted diphenyl in the present compositions, such. For example, the alkali metal salts of 4,4'-bis (2-sulfostyryl-) biphenyl, 4,4'-bis (4-chloro-3-sulfostyryl-) diphenyl or 4- (4-Chlorstyryl-) 4 '- (2 -sulfostyryl-) biphenyl. Mixtures of the aforementioned brighteners may be included. Another inventively employable group of suitable additives are UV-protective substances. These are substances that are released during the washing process or in the subsequent Weichspülprozeß in the wash liquor and accumulate accumulative on the fiber, and then to achieve a UV protective effect. Suitable products from Ciba Specialty Chemicals located under the name Tinosorb are commercially available. Another usable in the inventive compositions group of additives are dyes, especially water-soluble or water-dispersible dyes. Preferably, dyes, such as are used to improve the optical appearance of the product in washing and cleaning compositions or in personal care products usually have here. The selection of such dyes are no difficulties to the expert, especially since such conventional dyes have high storage stability and insensitivity to the other ingredients of the wash-active preparations and to light, and no pronounced affinity for the top layer of skin, textile fibers or keratin fibers have to not to color. The dyes are present in the detergents or cleaning agents according to the invention or in personal care products in amounts of less than 0.01 wt .-%. Another group of additives that may be included in the inventive detergents or cleaning compositions are bleaching catalysts, in particular bleach catalysts for machine dishwashing detergents or laundry detergents. It uses only complexes of manganese and cobalt, especially with nitrogen-containing ligands. Another group of additives that may be included in the compositions, provided these are compositions that come with silver contacts, for example, dishwashing detergents, are silver protectants. It is here to a plurality of most cyclic organic compounds which are known to the skilled person addressed here also and contribute to the tarnishing of silver-containing articles to prevent the cleaning process. Specific examples include triazoles, benzotriazoles and their complexes with metals such as Mn, Co, Zn, Fe, Mo, W or Cu. As a further inventive additives may be included in the inventive washing or cleaning compositions soil repellents, ie polymers that are absorbed on fibers or hard surfaces (for example, on porcelain and glass), positively influence the oil and fat removal from textiles and thus counteract resoiling targeted , This effect becomes particularly clear when a textile, or a hard object (porcelain, glass) is dirty, the / has been already been previously washed several times with an inventive washing or cleaning agent containing this oil- and fat-dissolving component. Preferred oil- and fat-dissolving components include, for example, nonionic cellulose ethers such as methyl cellulose and methylhydroxypropyl cellulose with a content of methoxy groups of 15 to 30 wt .-% and a hydroxypropoxyl 1 to 15 wt .-%, each based on the nonionic cellulose ether, and known from the prior art polymers of phthalic acid and / or terephthalic acid or derivatives thereof, more particularly polymers of ethylene terephthalates and / or polyethylene glycol terephthalates or anionically and / or nonionically modified derivatives thereof. Especially preferred of these, the sulfonated derivatives of phthalic acid and terephthalic acid polymers. Said additives are present in the inventive compositions in amounts not exceeding 30 wt .-%, preferably 2 to 20 wt .-%, of. The inventive washing or cleaning agents or body care product according to the invention can contain fragrances beyond. As fragrances are in principle all usable fragrances are commonly used in washing or cleaning agents. If an inventive washing or cleaning agent or an inventive personal care nano- or microcapsules, as have already been described within the preceding text contains, and if such a nano- or microcapsules already contain a perfume or a mixture of two or more fragrance substances, , an inventive washing or cleaning agent or a personal care product according to the invention still further include a fragrance or a mixture of two or more further fragrances, which are not present in encapsulated form. In such fragrances may be to fragrances, which are identical to or present in encapsulated form fragrances. These may, however, also be fragrances which are different from the present in encapsulated form fragrances. Thus, for example, be achieved in that a treated according to the invention with a detergent or cleaning agent substrate directly after the treatment has a specific odor, while it shows a different smell during prolonged storage or in use. Suitable perfume oils or perfumes include individual perfume compounds can be used, for example synthetic products of the ester, ether, aldehyde, ketone, alcohol and hydrocarbon type. Fragrance compounds of the ester type are, for example, benzyl acetate, ethyl isobutyrate phenoxy, p-tert-butylcyclohexyl acetate, linalyl acetate, dimethylbenzyl carbinylacetat, phenylethyl acetate, Linalyl benzoate, benzyl formate, ethyl methyl phenylglycinate, Allylcyclohexylpropionat, Styrallylpropionat and benzyl salicylate. The ethers, for example, benzyl. The aldehydes include count. For example, linear alkanals having 8 to 18 carbon atoms, citral, citronellal, Citronellyloxy- acetaldehyde, cyclamen aldehyde, hydroxycitronellal, Lileal and bourgeonal. The ketones include the ionones, α-isomethylionone, and methyl. The alcohols include anethole, citronellol, eugenol, geraniol, linalool, phenylethyl alcohol and terpineol. The hydrocarbons mainly include terpenes such as limonene and pinene. If desired, mixtures of different fragrances are used which are matched to one another that they together produce a pleasing fragrance note. Such perfume oils can also contain natural odorant mixtures, as are obtainable from plant sources. Examples are pine, citrus, jasmine, patchouli, rose or ylang-ylang oil. Also suitable are nutmeg oil, sage oil, chamomile oil, clove oil, lemon balm oil, mint oil, cinnamon leaf oil, lime blossom oil, juniper berry oil, vetiver oil, galbanum oil and laudanum oil and orange blossom oil, neroli oil, orange peel oil and sandalwood oil. 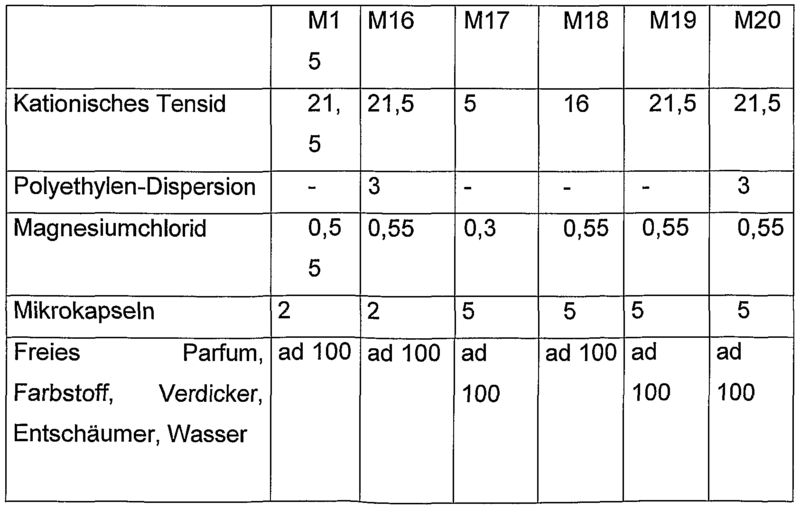 The content of the compositions of the invention to non-encapsulated perfumes may, for example up to 2 wt .-% amount. If it is in an inventive composition is a personal care product, particularly a hair product, such a preparation of the invention may contain one or more further, typical compounds for such preparations in addition to one or more of the compounds already mentioned above. Such formulations may for example contain, in addition to or instead of one or more of the already enumerated, other compounds a vitamin and / or a vitamin derivative. Basically, natural, synthetic, water-soluble or oil-soluble vitamins and vitamin derivatives are suitable. Particularly suitable vitamins and vitamin derivatives are for example vitamin A, vitamin E, vitamin E acetate, vitamin E nicotinate, vitamin F, vitamin B 3, vitamin B 6, nicotinic acid amide, vitamin H, vitamin C, vitamin B 5 and derivatives thereof, in particular panthenol, pantothenic acid, calcium pantothenate, Panthotenylethyl- ether, Panthenylhydroxypropylsteardimoniumchlorid (Panthequat®, Innovachem) Panthetine and panthenyl triacetate. Of course, analogous derivatives, for example Panthotenylpropylether, Panthotenylbutylether and other branched or linear, saturated or unsaturated homologs are also suitable. The same applies to the salts of pantothenic acid, the possible counter ions are not limited to only calcium, but also all physiologically acceptable metal cations, for example the alkali and alkaline earth metals, in particular, include magnesium, sodium or potassium. The invention also includes the use of all possible stereoisomers of the various vitamins, where 5 and its derivatives, both the D- and the L-form, and all mixtures of the two forms can be used according to the invention especially when vitamin B.
Preferably, the use of vitamin C, vitamin H, vitamin E and its derivatives, and vitamin B 5 and derivatives thereof, wherein the use of vitamin H, vitamin E acetate, panthenol, and vitamin B 6 Panthequat® is particularly preferred. In general, the vitamins or vitamin derivatives in the present invention are for personal care, in particular for hair care certain preparations in amounts of 0.01 to 30 wt .-%, based on the total preparation, is used. Typically, are ready to use for preparing aqueous preparations of 0.02 to 15, particularly 0.02 to 8 wt .-%, especially advantageously. In many cases, amounts between 0.05 and 5 wt .-% are sufficient. For concentrates, it may be advantageous to use vitamins and / or vitamin derivatives in amounts of 0.05 to 30% by weight, in particular from 1 to 25 wt .-% and particularly preferably from 3 to 20% by weight. The personal care compositions may contain, in addition to the components and protein. Protein hydrolysates, a mixture of amino acids, oligopeptides and polypeptides and derivatives thereof is understood. According to the invention which can be used are amino acids such as arginine, lysine, cysteine, glutamine, asparagine, and valine. Also included as suitable are mixtures of amino acids have shown how they can be obtained by substantially complete basic, acidic or enzymatic hydrolysis of animal or vegetable proteins. According to the invention usable oligopeptides and polypeptides are, for example animal and vegetable proteins or their recovered on acidic, basic or enzymatic routes (partial) hydrolysates. Suitable proteins are, for example, keratin, collagen, elastin, soy protein, milk protein, casein, fibroins, sericin, wheat protein, silk protein, almond protein. Keratin and vegetable proteins may be preferred in the invention. Formed by the hydrolysis mixtures with average molecular weights ranging from about 400 to about 50,000 Daltons. Typical average molecular weights are in a range of about 500 to about 8000 daltons. Hydrolysates of keratin and plant proteins are preferred in the invention. Derivatives of amino acids, oligopeptides and polypeptides their cationic derivatives, and their condensation products with fatty acids are understood according to the invention. Cationic derivatives are obtained by reaction with compounds usually carry quaternary ammonium groups, or by reaction with corresponding amines, and subsequent quaternization. "Hydroxypropyltrimonium Hydrolyzed Collagen" (Croda) as well as the Lexein®QX 3000 (Inolex) available quaternized protein hydrolyzate. To prepare the condensation products of protein hydrolysates with fatty acids are preferred as the acid component of oleic acid, myristic acid, undecylenic acid, coconut fatty acid and abietic used. These condensation products may also be in the form of salts, in particular sodium, potassium and triethanolamine. The condensation products based on collagen hydrolyzate also bear the CTFA names oleoyl Hydrolyzed Collagen, Hydrolyzed Collagen myristoyl, oleoyl Hydrolyzed Animal Collagen, Potassium Coco Hydrolyzed Animal Protein, TEA Abietoyl Hydrolyzed Collagen, Potassium Undecylenoyl Hydrolyzed Collagen and TEA Coco Hydrolyzed Collagen. Commercial products are, for example Lamepon®LPO, Lamepon®4 SK, Lamepon®UD, Lamepon®460, Lamepon®PA TR, Lamepon®ST 40 and Lamepon®S (Grunau) and Lexein®A 240, 620 and Lexein®S Lexein®A 520 (Inolex). Condensation products of elastin with fatty acids, for example lauric acid (CTFA name: Lauroyl Hydrolyzed Elastin) may also be used. Crolastin®AS (Croda) is a corresponding commercial product. available under the name Promois® EGCP is a Potassium Cocoyl Hydrolyzed Wheat Protein (Seiwa). Further according to the invention are commercial products Lexein®A 200 (Inolex), Lamepon®PO-TR, Lamepon®PA-K, Lamepon®S-MV and Lamepon®S-TR (Grunau) and Crotein®CCT (Croda). A composition according to the invention, such as is used as personal care products, in particular as hair care products, can additionally contain other, conventional additives. Antioxidants. The inventive compositions may contain a proportion of water beyond. The water content can for example be up to about 95 wt .-%. The compositions of the invention may provided for in the context of the present invention, the nano- or microcapsules in an amount of up to about 30 wt .-%, in particular in an amount of from about 0.1 to about 25 wt .-% or about 0.5 to about 20 wt .-% or about 1 to about 15 wt .-% or about 5 to about 10 wt .-% by weight. An inventive composition may, for example, only one type of microcapsules. However, it is also contemplated within the present invention that a composition of the invention contains a mixture of two or more different microcapsules, wherein the different microcapsules may, for example, with regard to the composition of the capsule shell, the capsule content, or both, differ. Dishwashing detergents, dishwasher detergents, rinse aids, cleaners for hard surfaces, especially floors, soaps, shower gels or hair treatment products, especially shampoos, hair conditioners, hair treatments, hair color, hair-end fluids, dyes or waving lotions. is illustrated by the following examples. 125 g of ethyl cyanoacrylate were heated with 100 g of cis-hexenol 1 wt .-% of tetrabutyl titanate in the presence of 0.1 g of trifluoromethanesulfonic acid until no elimination of ethanol was longer observed. The reaction was quenched with 1, 5 g of 85% phosphoric acid and the product of the mixture by fractional distillation isolated. b) 95 ml of absolute ethanol was n HCl are added with 0.25 ml of 0.1.
c) 1, 89 g Miglyol 812 N (C12-18 triglyceride, manufactured by Fa. Condea) were filled with solution b) to 12.5 ml. d) 0.25 g of cis-Hexenylcyanacrylat of Example 1 were filled with solution b) to 12.5 ml. Subsequently, solution b) and c) is pumped at a feed rate of 0.5 ml / min through the mixing chamber a rotor-stator stirrer in the aqueous solution a). The aqueous solution was being stirred with a stirrer speed of 400 rpm. After complete listing of solutions b) and c) the resulting milky suspension was stirred for an additional hour. The resulting capsules had a mean particle diameter of 1, 7 microns. It was indicated in Example 2, instead of Miglyol 812N However 9 g cis-hexenol 1 were used. 16 wt .-% esterquat was mixed with 80 wt .-% water and 4 wt .-% Cyanacrylatkapseln mixed from Example 3. FIG. As a comparative example a mixture of 16 wt .-% esterquat and 84 wt .-% water was used. Cotton fabrics were treated with the thus obtained fabric softeners, where the quantitative ratio of fabric softener to dry laundry 10g / kg, the liquor ratio 1: 5 and the treatment time was 5 minutes. Both the treated fabric sample according to the invention and the comparative sample exhibited a substantially neutral smell directly after washing. Both samples were split, with one part ironed and the other part was treated in the dryer. In both cases, a fresh, "green" smell could be perceived in the inventively treated sample. The comparative sample had no odor changes. 3. Polymer mixture comprising a polymer according to claim 2 and at least one further polymer. 4. Washing or cleaning composition or composition for body care, containing at least an anionic surfactant or a mixture of two or more such surfactants or a cationic surfactant or a mixture of two or more of such surfactants and a nano- or microcapsule comprising a capsule shell and a capsule content, or a mixture of two or more such nano- or microcapsules, wherein the capsule shell contains at least one Polycyanacrylatester and the capsule contents at least one non-detergency ingredient. 5. Washing or cleaning composition or personal care composition according to claim 4, characterized in that it contains at least one nonionic surfactant. 6. Washing or cleaning composition or personal care composition according to claim 4 or 5, characterized in that it contains at least as a capsule content of a fragrance or an antiblocking agent or a mixture thereof. 8. Washing or cleaning composition or personal care composition according to any one of claims 4 to 7, characterized in that it contains at least one builder substance. 9. Washing or cleaning composition or personal care composition according to any one of claims 4 to 8, characterized in that it contains the nano- or microcapsules in an amount of up to about 30 wt .-%. 11. The use of nano- or microcapsules according to claim 10 as a constituent of active washing or cleaning compositions or compositions for personal care. ES2288951T3 (en) 2008-02-01 Using nanoscale particles for improved soil release. ES2272758T3 (en) 2007-05-01 Treatment for substrates. ES2241370T3 (en) 2005-10-16 Laundry product compositions for reducing wrinkles.